SKU: S39. 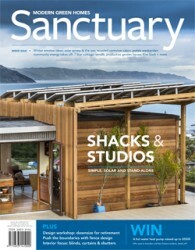 Category: Sanctuary. Tags: sustainable design, building, Energy Efficiency. 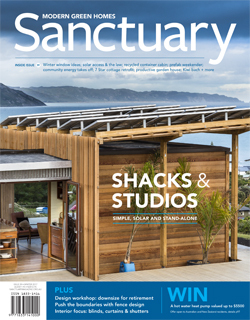 Five fabulous projects get back to basics with good design and a simple aesthetic, including a backyard shack in Tassie; stunning prefab and solar Kiwi ‘bach’; non-toxic studio home with natural features; prefab weekender with a modular design and a recycled container cabin in Queensland made from salvaged materials. A creative response to the constraints of an awkwardly shaped site leads to an eye-catching curvilinear family home west of Melbourne. An old Sydney worker’s cottage is transformed into a modernist, timber-clad cube that brings more space and light to a growing family. By renovating the garden at the same time as the house, a Yarraville extension makes savings in cost and waste. This new home in the ACT stands out from the crowd with its affordability and sustainability. As more people head to court to try and keep the sun on their solar PV, lawyer Peter Clarke investigates the strength of right to light laws. High-performance curtains, blinds and shutters can brighten your interior and help keep you comfortable too. Marie Carrel from Planet Architecture helps farmers Karin and Bruce downsize into the low-maintenance, comfortable home in town they always hoped for. 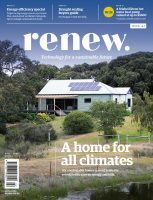 Can the 90+ community energy projects in Australia fuel a faster and fairer transition to a greener grid? The global repair café movement is reducing waste, building community and reviving the art of tinkering, writes Michelle Fisher. Mara Ripani showcases exciting new sustainable fence materials and design ideas.